My good friend, Jenn, has a new vegan cafe in Eatonville, Florida. We sat down to chat about many things. This 32-minute episode was delightful to record with Jenn.&nbsp; Enjoy! I thoroughly enjoyed visiting with my friend, Chef Jenn, in her new vegan cafe in Eatonville, Florida. We covered a variety of topics and shared a few memories of how we became friends. This 32-minute episode makes me very happy. Her name on all social media platforms is DaJenEats. Beer ice cream?!!! Now THAT’s inventive! All the best to your friend, Dee, as she launches her new venture. Loved hearing your shared story! Thanks, Kathy! The future is bright with Chef Jenn leading the way. Great things ahead. What an awesome interview! I’m grinning ear-to-ear. Clearly, you both enjoyed yourselves. I remember you finding Jenn and getting her food delivered. I also remember how excited you were after the ice cream social. Insider tip: Dee was an ice cream fiend her whole life; when she became vegan, the first thing I worried about was her ice cream options. 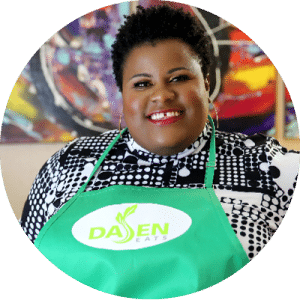 DaJenn’s Iire Cream made her so happy & energized her for finding good local food. P.S. Many years ago, Nicole Perpillant was my boss and I remember when she and Jean started jpDesign Theory. How amazing to hear their names pop up here. (singing “It’s A Small World”).